SHAKE IT UP, BABY » Makua Marumoto sings backup on "Twist and Shout" during a class session of Rock Works Music at the Blaisdell Exhibition Hall. 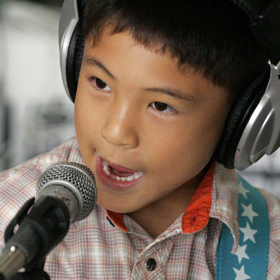 Rock Works teaches young rockers the finer points of performing in a band. Roy E. Disney cedes skippering duties on Pyewacket to his son. Election officials are preparing to solicit bids for a balloting system. The victims include a pedestrian struck by an SUV in a crosswalk. There's a whole lotta learnin' goin' on as kids plug in and play together. Lanikai scored 83 points to win the John D. Kaupiko Regatta at Ke'ehi Lagoon. Resti Paguirigan wants you to know that electricity can be dangerous. A study co-authored by a University of Hawaii psychologist finds that overweight children continue to be stigmatized. The federal government is poised to approve rules for the Navy's continued use of low-frequency sonar.